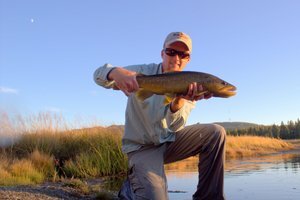 One of the challenges of fishing in the cooler months is staying warm, especially if you are catching a lot of fish and have to constantly be dealing with unhooking them. I have wanted to share my system for staying warm and almost waited too long. The warm months stretch ahead of us now, but hopefully this will help you plan for next winter. A couple of weeks ago I was contacted by David French from handwarmers.net about doing a product review on their hand warmers. It was a great opportunity to pick up a few handwarmers as well as motivate me to write this post that I have been planning for awhile. First of all, I personally feel that handwarmers are crucial to my happiness when winter fishing. I always have at least one in a pocket and sometimes have two ready, one for each hand. My indicator that tells me I am too cold is simply this: if I can't tie knots then I'm too cold and it is time to spend a couple of minutes warming my hands. If I'm cold enough that I can't get warm using handwarmers, then I have a more serious problem and either need to return to my car or build a small fire. Next, you need a way to stay dry. I never touch fish with gloves and don't recommend doing it unless you have a pair with a rubber finish to minimize the damage to the fish. There are two alternatives: either carry a net and simply never touch the fish or remove your glove each time you land the fish. I have used both and any time I want a picture of a particularly good fish I remove my gloves. Afterwords, the water on your hands and the cold air temperatures will have your hands miserable in no time. So I have started carrying a small hand towel or even a washcloth. I just keep it tucked in my wading belt so it is always there when I want to dry my hands. Each year I try to do a trip for spring break. For the past several years I have been going to the Smokies to chase trout and the first spring hatches. This year some friends were wanting to do something out of the ordinary. Just a week before break was supposed to start someone suggested going to the Everglades in Florida and doing some canoeing. While I love the Smokies, I’ll usually give other things a try occasionally as well so I cleared my schedule. We took my canoe down and rented another. There were five of us so two canoes would suffice. With just a couple of days to go before departure, I was fortunate enough to talk to Ian Rutter and gain some valuable advice on fishing the area. 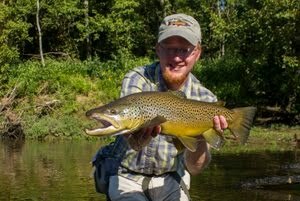 This trip was not specifically a fishing trip although I obviously intended to take a fly rod along. Before I knew it the day of departure had arrived and we were driving south. We left in the afternoon and just drove through the night, arriving in Everglades City the next morning. Originally I had hoped to paddle out of Flamingo and all my fishing information was on that area. Things worked out well though from a monetary standpoint. Canoe rentals were only $25 a day in Everglades City as compared to $50 a day at Flamingo. Also, we were able to score a beach campsite that was free. The small island we spent two nights on was between 7 and 8 miles by canoe from Everglades City. On the way out we saw porpoises including what appeared to be a young one that was much smaller than the rest. After driving through the night, we were all exhausted. Upon arriving where we were to camp, I set up my tent, crawled in and just fell asleep. The next day we planned on doing a paddle around the area and then going back to our beach site. I had barely crawled out of my tent before one of my friends excitedly told me to come and try to catch the shark. I walked the 100 hundred or so feet over to where they had seen this fish, and sure enough, something was slowly cruising back and forth in the surf. Back at my tent, I strung up the fly rod and tied on a big Clouser. The fish was still working the shoreline when I got back so I waded out to get a little closer. Apparently, Clouser Minnows were not on the menu. After several minutes of fruitless casting, the fish vanished for a minute as it turned around to come back down the beach. When it reappeared, it was no more than 5 or 6 feet away. The murky water kept it from seeing me and being frightened. Immediately I realized it was not a shark but a nice tarpon. The huge scales gave it away. I didn’t have much in the way of other flies to try (more on that shortly) and acting on impulse, I reached out and grabbed its tail. At first it didn’t seem to notice until it tried to move. Upon realizing that something was now attached to its tail, the fish made a rapid escape towards the open ocean. I never saw it in as close again although that evening it, at least I like to think it was the same one, was rolling probably 75 yards offshore. After the tarpon vanished, we ate breakfast and prepared for the day’s adventures. We wanted to paddle through some of the smaller channels where the opportunity to view wildlife would be greater. Over the course of the day, we saw plenty of birds and also a manatee. This was my best opportunity to get a little fishing in, and although I didn’t fish as much as I would have liked, I still had a good time. I caught what I believe was a Mangrove Snapper and also had what looked to be a baby tarpon blow up on the fly but couldn’t hook up. In addition to seeing the wildlife and enjoying fishing, we also found a cool mangrove tunnel to paddle through. All of these elements combined to create a great total experience. That evening the tarpon was rolling offshore again but too far out to cast to from shore. After a hearty supper, we hit the sack to be ready for the paddle out the next day. The last day on the water was the most difficult day of paddling, largely because my body was sore from the unaccustomed paddling the previous two days. The tide was mostly to our advantage paddling back, but we were paddling directly into the wind. We planned a route that would take us through smaller channels where wildlife was more likely to be found. The mnost exciting part of the paddle back was when a school of rays came swimming by. I was lucky to have the polarizing filter on my camera and got a couple of pictures. The sky grew darker as we got closer to our take out point. It looked like a bad storm would break at any moment, but miraculously we made it back safely. After loading the gear and canoe, we started driving east. No more than 5 minutes down the road, the storm broke in all its fury with a wall of rain that caused progress to slow to a crawl. Still, we continued east with the eventual goal of heading south towards Homestead and the other entrance to the Everglades. We didn’t move nearly as fast as we were hoping and it was after dark by the time we arrived at Flamingo and found a campsite. One of the things that Ian Rutter emphasized to me was the need to stay in after dark. I try to avoid bug repellent (at least anything containing Deet) as much as possible, but within 30 seconds of exciting the van at Flamingo I asked for the can of Deet and applied a liberal amount all over my clothes. There are showers at Flamingo so I could clean up as soon as the tent was up. After putting up my tent and getting a shower for the first time in a few days I crawled into my tent. The mosquitoes were so thick that I literally heard a continuous hum as the bugs swarmed all over the mesh of my tent as they tried to get to me for a feast. Four or five had entered the tent at the same time I did so the first few minutes in my tent were dedicated to a mosquito hunt. Only after dispatching the bloodthirsty critters could I sleep in peace, the hum of hundreds of mosquitoes still loud in my ears. The next morning, the vast majority of the bugs were gone. Apparently they only come out en masse under the cover of darkness, and that is consistent with the advice I got from Ian. Our last full day in Florida was dedicated to checking out the areas wildlife. I got my alligator pictures and then some. We also saw a crocodile and plenty of birds including spoonbills. To cap off the trip, we drove out to Key West to see the sunset before beginning the long drive back home. The drive back was around 18 hours. Since I stayed awake with the driver for most of the night and then drove the whole daylight portion, I was exhausted and took a long nap when we got back. The trip was awesome although it would have been nice to spend more time fishing. Someday I hope to return and do another trip in the Everglades when the fishing is better. Much thanks to everyone that responded here on my blog and also via email to give me advice on the trip. If I had just gone to fish it would have been a disappointing trip as many of you suggested, but I had a great time with friends and was able to see a lot of interesting wildlife in the process. I’m currently in the process of planning something bigger and better for next year’s spring break. Lots of backpacking and a sizable dose of fishing will be included. All photos without a credit are taken and copyrighted by me. 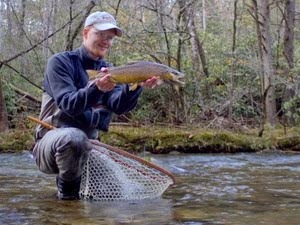 Traditionally, the first week of March also brings the first quality hatches in the Smokies. This year has brought colder than normal temperatures meaning that many people here in east Tennessee have a severe case of cabin fever. The cold weather is hanging on strong, bringing snow across the area today. The high elevations in the Park have a lot of snow with Mt. Leconte probably well over 4 feet by now due to this latest storm. Even the low elevation streams will be running cool for awhile due to the effects of snowmelt. The Quill Gordons and Blue Quills should be hatching any day now, but the cool water temperatures will probably keep the hatch from getting heavy anytime soon. In addition to the first mayflies of the year, we should also be seeing brown and black stoneflies and also little black caddis. I've been tying hard the last several days trying to prepare for the new season. This weekend I intend to put all those flies to good use and will likely fish the Caney and also hopefully the Smokies. The following week I'll be off for a few days for spring break and will spend as much time on the water as possible. 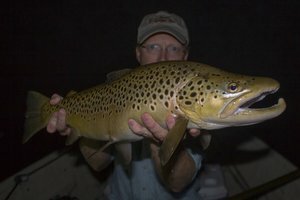 It is about time as I have only averaged 3 days on the water a month so far this year. Those that know me realize that I normally fish a lot more than that. 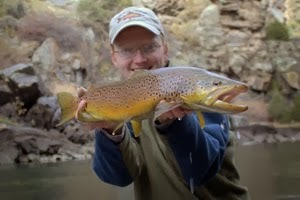 I'm looking forward to the spring fishing for various warmwater species as well. Bluegill are always fun, and it should be time for white bass and stripers soon as well... Hopefully all of you will be getting out a lot over the next few weeks as fishing heats up with the weather!